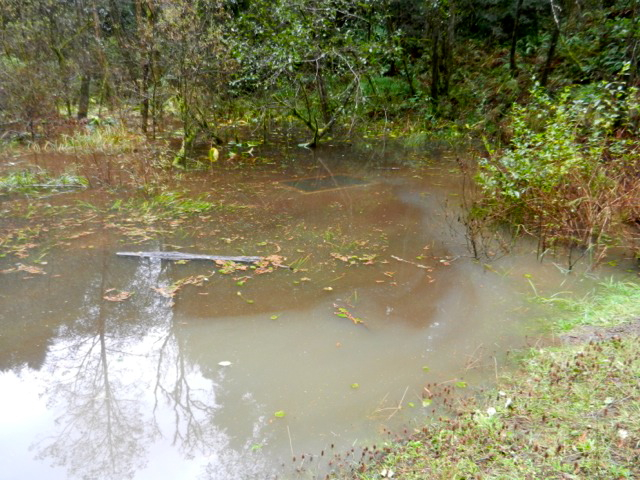 Sometime during the first week of November 2012, unknown suspect(s) caused significant damage to the Jolly Giant Dam located about one mile east of Humboldt State University in the Arcata Community Forest near trail #8. The suspect(s) cut the lock to a steel grate lid leading to the outlet control structure on the dam exposing the pipe that drains the reservoir. The suspect(s) threw rocks and debris into the drainage pipe significantly obstructing water flow from Jolly Giant Reservoir into the creek. The Arcata Public Works Department was able to removed some of the debris, but the drain pipe remains partially plugged restricting water flow. The restricted flow could cause the reservoir’s water level to rise and potentially compromise the dam. The Arcata Environmental Services Department is closely monitoring the structure. Removing all of the lodged debris from the drainage pipe will be a complicated and costly project. Jolly Giant Dam was constructed in 1935 by the Union Water Company. It has not been used for the City water supply since the mid 1960’s. The Arcata Police Department is actively investigating the vandalism to the Jolly Giant Dam and is asking anyone with information regarding this crime to contact the Arcata Police Department at 822-2428. The cost of the damage is unknown at this time, but is expected to be significant. The City of Arcata is offering a reward of $500 to anyone with information leading to the arrest and conviction of the person(s) responsible for the vandalism to Jolly Giant Dam. This entry was posted on Wednesday, November 21st, 2012 at 5:08 pm	and is filed under News, Environment. You can follow any responses to this entry through the RSS 2.0 feed.